This is a staple that I like to have in my kitchen all the time! I put these on top of stews, steak, pizza and even salads! They add a great depth of flavor to any finished dish! I make a lot of them because they take some time and then I can just store them in my fridge & heat up as needed. Cut onions in half (through the stem), peel back the tough top layers. Slice onions to create half circles. Slices should be approx 1/8" thick. 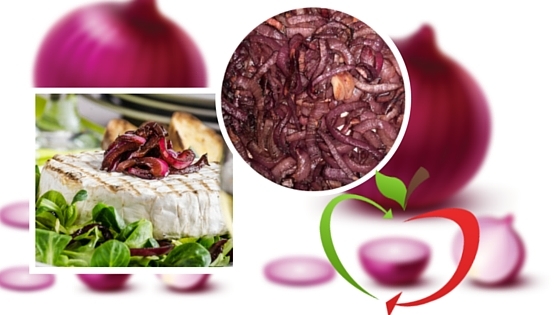 In a large bowl, toss the oil, vinegar, salt & pepper evenly through the onions. Divide the mixture into half and evenly turn out onto two 1/2 sheet pan, each lined with a silpat baking liner to create a non-stick baking surface. Bake for 1 hour, checking every 10 minutes and tossing the onions to ensure even caramelization. Make an effort to keep the pile of onions together, which will help prevent burning.